I attended Crimelandia - Left Coast Crime 2015 this past week and on a scale from one to ten, the conference was an eleven. So. Much. Fun. 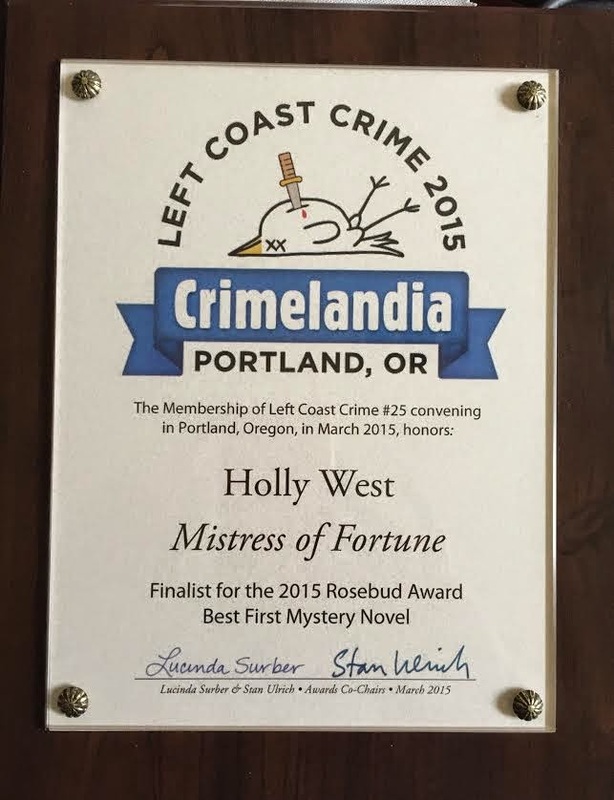 You might recall that my novel, MISTRESS OF FORTUNE, was nominated for the Rosebud Award for Best First Mystery Novel. Being a nominee was pretty much the greatest thing ever. Okay, actually winning the award might've been greater but they gave me this plaque so I still feel like a superstar. Allen Eskins won for THE LIFE WE BURY. I'm looking forward to reading it, as it's also nominated for several other awards, including the Edgar. As usual, I came home from the conference with loads of new ideas. Library sales, specifically, how to get them, is number one on the list. This isn't wholly the result of attending Left Coast Crime, but after attending a panel on how to market one's books, I'm newly energized to pursue the goal of getting my ebooks into as many public libraries as I can. For this, I need your help. Recently, I asked a couple of family members to contact their public libraries and request that they order MISTRESS OF FORTUNE and MISTRESS OF LIES. As a result, both books are now part of the Yolo County Public Library collection. Even better, MISTRESS OF FORTUNE is currently checked out. For my part, I'm contacting as many libraries as I can myself. I've written a pitch letter that includes a brief synopsis of each book, a couple of blurbs, and a mention of my recent award nomination. For example, there was a librarian at Left Coast Crime who participated in the "Buy My Book" marketing panel. I wrote to her directly, explained that I'd seen her speak and that I was a nominee. She replied today saying she planned on buying both of my books. Synopsis:Isabel, Lady Wilde, a mistress to King Charles II, has a secret: she makes her living disguised as Mistress Ruby, a fortune-teller who caters to London’s elite. When a prominent local magistrate seeks Mistress Ruby's counsel about his unwitting involvement in a plot to kill the king and is found brutally murdered shortly thereafter, she takes up the investigation and discovers a dangerous political conspiracy that leads all the way to the throne. As she delves deeper into the mystery, not even the king may be able to save her. When a beggar girl shows up at Isabel's home claiming to be her niece, Isabel is skeptical because she always believed that her brother, Adam, had died, without wife or child, of the plague. But after the girl reveals that Adam was in fact murdered, Isabel is compelled to take up an impossible task: discover the truth about her brother's death, twelve years after it happened. As she learns about her brother's dark secrets, she begins to wonder whether the past is better left buried--especially when uncovering the truth could lead to her own funeral. I'm sure I'm not the only author who can benefit from such a grass roots effort to get our books into libraries. I'm happy to make requests on your behalf to my own public library, so contact me in the comments if you'd like me to do so. I'll take care of Houston and Harris County. Getting into libraries is high on my priority list as well. I already uploaded my request to HPL this morning. Will get to Harris County later today. Re: Facebook - probably b/c there's just a ton of stuff going on.